4062, Hubcaps used, 13", 80-81, OLDS, OMEGA , CHROME OUTER RING, WIRE TYPE, CHROME RAISED CENTER, 4 SETS OF SAW TOOTH CLIPS, EMBLEM FOR CENTER SOLD SEPARATE. A & B CENTER DIFFER. 4081, Hubcap used, 14", 81, OLDS, CUTLASS. CHROME WIRE TYPE, CHROME CENTER, W/O BACKING PLATE, 4 SETS OF SAW TOOTH CLIPS. 4111a, HUBCAP USED, 14", 89-90, OLDS, CIERA, CALAIS, 20 SLOT TYPE, SILVER [LIGHT GRAY], WITH ENGRAVED LOGO IN CENTER, METAL SAWTOOTH CLIPS . B=DARK GRAY. C=WHITE. 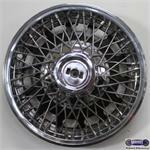 5087, HUBCAP USED, 15", 85-87, PONTIAC, BONNEVILLE, PARISIENNE, CHROME OUTER RING, WIRE TYPE, RAISE CENTER , SAW TOOTH CLIPS. CENTER SOLD SEPARATE. 55529, Hubcaps used, 14", 95-96', HYUNDAI, SONATA, SILVER, 7 SPOKE, RAISED LOGO, SAW TOOTH CLIPS. 55545, HUBCAP USED, 14", 99-00, HYUNDAI, SONATA, SPARKLE SILVER, 7 SPOKE, 4 FAKE CHROME LUG NUTS, RAISED LOGO, SAW TOOTH CLIPS. 7014a, HUBCAP USED, 16", 98-01, FORD, CROWN VICTORIA, 24 SLOTS FORD OVAL IN CENTER, METAL SHARP TOOTH CLIPS.